These resources, such as seminars, specialized career services, and professional organizations, will help you understand the important impact that early career development planning will have upon your ultimate career success and satisfaction. See ADAPT ™ Orientation for more information about this stage. These seminars are designed to be a call to action for doctoral students and postdoctoral trainees to take ownership of their career planning and professional development in the same way that they are responsible for their scholarly development. Receive a broad overview of career development resources available at the University, as well as start to build a framework for future career planning. The Office of Career Development and Placement Assistance (CDPA) provides University of Pittsburgh doctoral students career services and resources during their career journey. The Graduate and Professional Student Government (GPSG) is the student government for all graduate and professional students at the University of Pittsburgh. GPSG connects graduate students to Pitt administrators, as well as to useful events and resources. 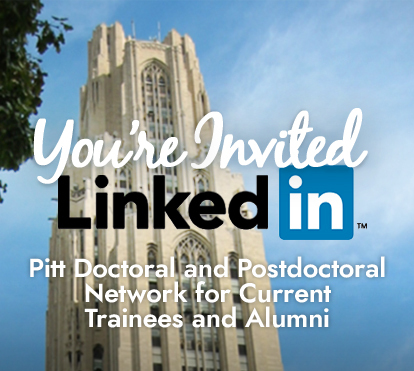 In addition to the national organization, the University of Pittsburgh Postdoctoral Association's mission is to facilitate a more constructive and positive experience for postdoctoral professionals that will benefit postdocs at the University of Pittsburgh alike.